9. Ed Belfour, Chicago Blackhawks. Eagle mask designed by Todd Miska, 1990-92. 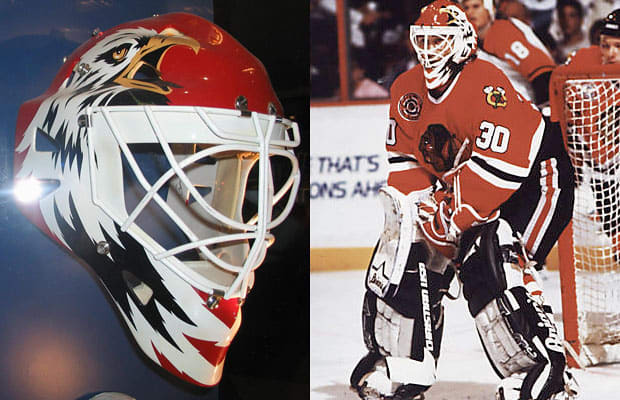 Upon seeing Ed Belfour's eagle mask, painful Mike Keenan (his head coach at the time) nicknamed Belfour "The Eagle". The moniker along with the eagle design has stuck ever since. There are many different versions of the bird motif by Miska, each becoming busier as Belfour got traded from one team to the next, but Miska's first vector-style eagle was the sickest and perhaps the most intimidating.